87 DATES IN 19 COUNTRIES! TAYLOR SWIFT’S 2011 SPEAK NOW WORLD TOUR! Toronto, ON – TAYLOR SWIFT announces the Speak Now World Tour 2011 in support of her blockbuster Speak Now album (released in Canada via Open Road Recordings / Universal Music Canada). Speak Now shattered sales records with over a million copies sold in the US in its first week of release. In Canada, Speak Now debuted at #1 on the Top 200, with the first single Mine reaching #1 on the Much Music & CMT video countdowns, and topping the charts at Canadian Country radio. The brand new single Back to December is the #1 Most Added song at Canadian country radio this week. Taylor is currently slated to play 87 shows in 19 countries spanning four continents on the TAYLOR SWIFT SPEAK NOW WORLD TOUR 2011, which kicks off on February 9th in Singapore. Confirmed Canadian dates for the 2011 world tour include Montreal on July 14, two shows in Toronto on July 15 and 16 at the Air Canada Centre, two shows in Edmonton on August 18 and 19 and two shows in Vancouver on September 10 and 11. Tickets for Toronto will be on sale on December 3, 2010 at 10 a.m. through www.ticketmaster.ca. Further information on venues and on sale dates to be announced. The 2011 tour dates will include six stadium shows throughout the US. Taylor’s 15-month, 107-date FEARLESS 2009 / 2010 Tour sold out arenas and stadiums in 88 cities in five countries. Taylor will play shows throughout Asia and Europe during the first quarter of 2011, before kicking off her North American tour on May 27th in Omaha, Neb. SPEAK NOW Tour dates are planned for later in the year in Australia and New Zealand. The North American leg of the tour is sponsored by COVERGIRL®, and ticket prices start at $25. The SPEAK NOW WORLD TOUR 2011 is one of the most-anticipated musical experiences of the year, as Taylor’s live show is renowned for her incredibly high-energy theatrical presentation of graphics, sets and visual elements, all conceptualized by Taylor herself. During the course of her show, Taylor plays a variety of instruments and has multiple wardrobe changes. 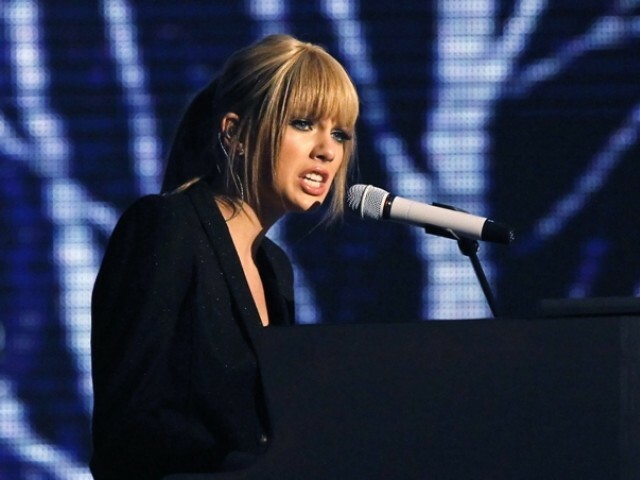 Each show, Taylor performs hit after hit from her three albums, including the chart-topping Mine, Love Story, You Belong With Me, Our Song, and Fifteen. Taylor Swift is a four-time GRAMMY winner, the top-selling digital artist in music history, has had singles top the Country and Pop radio charts, and had the #1 best-selling album in any genre of music in 2009. With 1,046,718 copies sold in the US in the first week of release, last month her Speak Now album scored SoundScan’s biggest single-week sales total since 2005 and is the biggest debuting country studio album in history. With the release of Speak Now, Taylor made history on the Billboard Hot 100, charting a record-breaking 11 songs from one album in a single week. Taylor, who writes all of her own songs, has career record sales now in excess of 17 million albums and 31 million song downloads. The North American leg of the TAYLOR SWIFT SPEAK NOW WORLD TOUR is sponsored by COVERGIRL®, and produced and promoted by The Messina Group (TMG.) The COVERGIRL® sponsorship is an expansion of the partnership announced earlier this year, when Taylor was named the newest COVERGIRL®. Taylor will appear as the face of natureluxe, COVERGIRL`s first luxury collection set to launch in January of 2011. TMG is a partner of AEG Live, one of the top live entertainment companies in the world, which produces world tours featuring internationally renowned artists and regional concerts and festivals. Founded by Ron Kitchener, Open Road Recordings is home to JUNO and Canadian Country Music Association (CCMA) Award winning groups Doc Walker, Emerson Drive, The Road Hammers (certified Gold in Canada), classic Canadian roots group Prairie Oyster, and break out success stories Dean Brody, High Valley, The Higgins, Ridley Bent and Tara Oram. Open Road Recordings represents Big Machine and Valory Records in Canada, which includes Taylor Swift (certified six times Platinum in Canada), Reba, Rascal Flatts, Jewel, Steel Magnolia, Justin Moore, Jack Ingram, Jimmy Wayne, Trisha Yearwood, and more. Open Road Recordings is a partnership with MapleCore Ltd., distributed by Universal Music Canada. Great post. Keep me updated with your content.